Yesterday, at the Fincantieri shipyard in Monfalcone, in the presence of the Deputy Prime Minister and Interior Minister of Italy, Matteo Salvini, and of the Deputy Minister of Infrastructure and Transport of Italy, Edoardo Rixi, Costa Cruises, the Italian brand of Carnival Corporation & plc, officially took delivery of Costa Venezia, its first ship designed specifically to offer the best of Italy to the Chinese market. On board Costa Venezia, Chinese guests will experience the uniqueness of Venetian and Italian culture. The ship’s theater is inspired by the Venetian La Fenice theater; the main atrium is reminiscent of St. Mark’s Square, while the main restaurants recall the traditional architecture of Venetian alleys and squares. Actual gondolas, made by the Squero di San Trovaso artisans, can also be found on board. Guests can also savor the delicacies of Italian cuisine, shop in the onboard shops with many famous “Made in Italy” brands and enjoy the internationally renowned Italian entertainment, with a masked ball that will recreate the magical atmosphere of the famous Carnival of Venice. They will also feel at home with a wide choice of Chinese food offered, Chinese-style karaoke, many parties including the “Golden Party,” full of surprises and gifts to be won every 10 minutes. 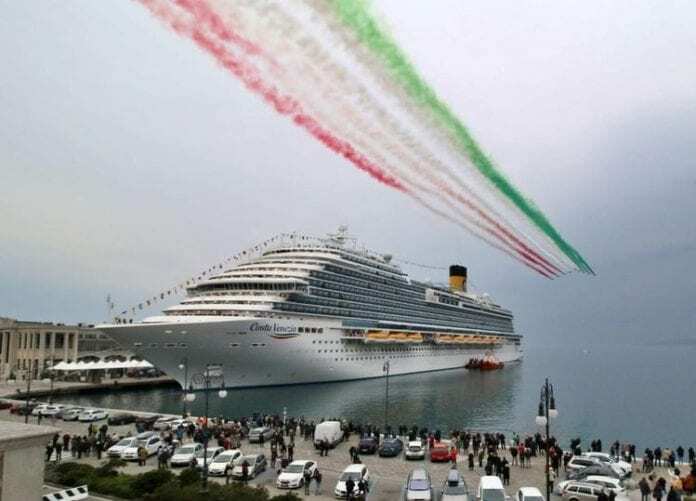 Costa Venezia’s naming ceremony is planned for today, March 1, in Trieste, with a spectacular air show by Frecce Tricolori acrobatic team and a firework display involving the whole city. The vernissage cruise will depart from Trieste March 3, bound for Greece and Croatia. On March 8, the ship will be back in Trieste for the start of its inaugural cruise: an exceptional, 53-day trip following the tracks of Marco Polo through the Mediterranean to the Middle East, South East Asia and the Far East before docking in Tokyo. The vernissage and inaugural cruises will be the only departures available to European and American guests wishing to enjoy a vacation on the new ship. From May 18, 2019, Costa Venezia will be dedicated exclusively to Chinese guests, offering cruises in Asia departing from Shanghai. After Costa Venezia, the group’s next ship to come into service, in October 2019, will be Costa Smeralda, the new Costa Cruises flagship and the first ship for the world market to be powered by liquefied natural gas (LNG). A second ship designed exclusively for the Chinese market, a sister ship to Costa Venezia, is currently under construction by Fincantieri in Marghera and is expected to be delivered in 2020.